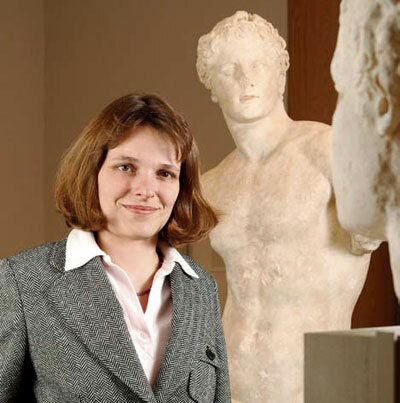 The recently appointed Hanfmann curator of ancient art at the Harvard University Art Museums and a lecturer on the classics, Susanne Ebbinghaus is an expert on, among other things, rhyta with animal foreparts in the Achaemenid empire and their reception in the West. This was the topic of the thesis that earned her a doctorate from Oxford in 1998, after undergraduate work in Freiburg, Germany, where she was born. She sometimes wishes she had picked objects for her attention that didnt need explaining to most inquirers, which doesnt diminish her interest in these typically horn-shaped, animal-headed vessels, used for prestige drinking by elites in the Persian empire in the later sixth century B.C. Rhyta have a hole at the bottom from which wine emerges nonstop unless one put ones finger over it, a messy and potentially riotous arrangement. The Greeks, who were apt in their literature and art to depict the Persians as effeminate and spoiled, adopted rhyta for their own use (for the world was a global village even then) but sometimes changed them into more sober cups. Behind Ebbinghaus in the photograph at the Sackler Museum is said to be the hero Meleager, who fought the Calydonian boar with Atalanta, but when curatorial duties permit she may investigate why he doesnt hold a spear and have a boars head at his feet. She decided to get into her line of work when she was eight and her parents took her hiking to an ancient site in the desert during a sandstorm. She wasnt happy about the sandstorm, but her mother said, Look at the ground. You can find shards. She did.